What could be bad for my health is that I have messed a bit with what is in essence a traditional recipe from the T*****e family. There are some things you probably shouldn't mess with, this recipe might be one of them. Let's see what happens when this is published, this could be my last post ever. This is a quite versatile soup that can be adapted to the occasion. You could have it for dinner as a winter warmer with some nice rolls or you could serve it in dainty little bowls as a posh-ish starter. 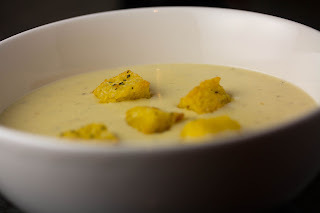 By adjusting the amount of stock you can make it more or less creamy to fit the occasion and your personal taste. When I cooked this I used about 560ml (1 pint or so) of stock which kept it very creamy. I've adjusted the recipe below to use 750ml for a slightly less creamy texture - but please feel free to freestyle it to your hearts content. As for the croutons... Yes, I know that you can buy them but let's face it - it is not really rocket surgery to make them yourself. It's quickly done and is a good way of using up some stale left over bread. As you can see from the recipe I used rosemary and chili infused oil. As always, freestyle it. Don't like rosemary, use thyme. Bit of a wuss, skip the chili oil and use a good quality normal olive oil. You still with me? Good. Let's look at the recipe now then. Melt the butter in a saucepan on a medium heat. Once it start bubbling and fizzing a bit, stir in the flour and keep stirring as to try and not get any lumps. Let this cook away for a couple of minutes, stirring constantly. Stir in the lime rind and keep stirring for another couple of minutes. Pour in the stock and keep stirring whilst bringing it to a boil. Keep at a simmer for about 5 minutes. Add in the cheese, and let it melt on a slightly lower heat whilst still stirring quite frequently. Once properly melted, sieve into another bowl or pan. Rinse and dry the first pan and then pop the sieved soup back into it. Put the pan back on a medium heat. Pour in the cream and keep stirring whilst you heat it through.